A mid-state family is fearful of what they say is a horrifying act of animal cruelty. They say their 5-month-old puppy "Sophie" was shot in the head and killed on Tuesday. 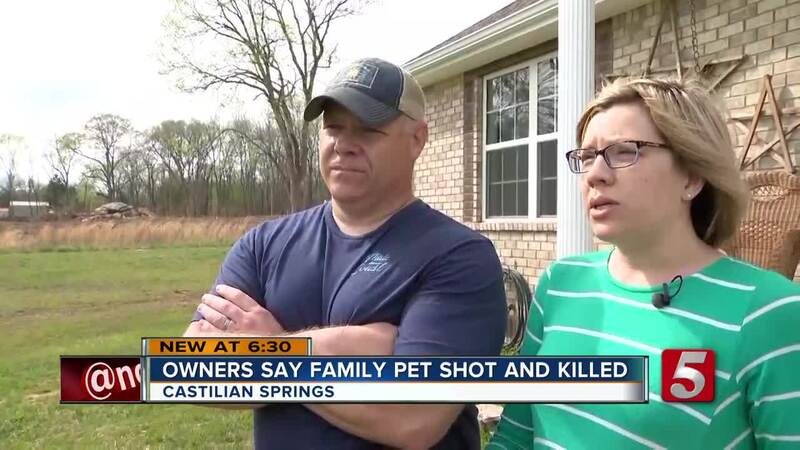 CASTALIAN SPRINGS, Tenn. — A mid-state family is fearful of what they say is a horrifying act of animal cruelty. They say their 5-month-old puppy "Sophie" was shot in the head and killed on Tuesday. Jennifer Wrinkle is still trying to comprehend how her 5-month-old labra-doodle ended up dead. She says her family found Sophie dead in a neighbor's back driveway, originally thinking it was the result of Sophie and another dog fighting, but they say they later found a bullet wound in Sophie's head. "We never imagined that someone would just kill her, she was just a 5 month old sweet little energetic dog, and someone for some reason, I don't know if it was meanness or a threat, or what it was, they cowardly shot her in the head," said Tony Wrinkle, Jennifer's husband.